DCI Erika Foster stumbles into another murder investigation while on her way to Christmas dinner. Marissa Lewis is the beautiful young woman who has been found brutally murdered on her own front doorstep. DCI Foster discovers that other people have been assaulted in the same neighbourhood and they all have one thing that links them to the murder victim - a figure dressed in black, wearing a gas mask. This case has many layers as DCI Foster uncovers the tangled web of secrets and deceit surrounding Marissa Lewis. 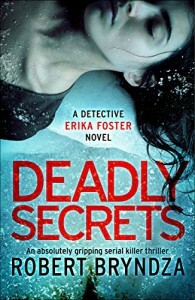 This is the sixth book in the Detective Erika Foster series and I found it to be the strongest one since the first book The Girl in the Ice. I'm not sure what to say that I haven't said in my other reviews - suspenseful, great cast of familiar characters. Erika's taking no bull from anyone. I thought the author was going to lose me towards the end, but everything worked out. This page-turner had no dull spots. I love this series! Thank you to Netgalley and Bookouture for an ARC.